CHIEF HYRKANIAN WARLORD (to a lesser warlord): What is best in life? LESSER WARLORD(proudly): A swift horse, the falcon at your breast, and the wind in your hair. CHIEF HYRKANIAN WARLORD: Wrong! Conan! What is best in life? 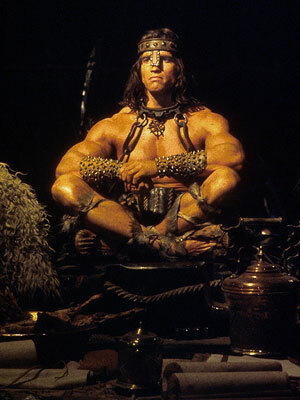 CONAN THE BARBARIAN: To crush your enemies, to see them driven before you and to hear the lamentation of their women! Last night, much to my horror, I witnessed California governor Arnold Schwarzenegger - aka Conan - address the throng at the Republican national Convention with perhaps the most shamelessly jingoistic and blatantly contrived “speech” that I have ever witnessed. Putting aside my own political leanings and looking at it for what it was, Ah-Nuld's oration came off exactly like the badly written Hollywood big-budget schmaltz that one would expect. for the actual, unaltered transcript of Ah-Nuld's address; simultaneously artificial, jingoistic, replete with movie references and bad jokes, horrifying and utterly nauseating in all respects. If you can't believe what you are reading, I have the whole thing on videotape and will happily show it to you upon request. Halfway through, what with the furor of the crowd and whatnot, I could only think of footage of Hitler at the Nuremberg rallies. Read it, and don't forget to supply the accent.